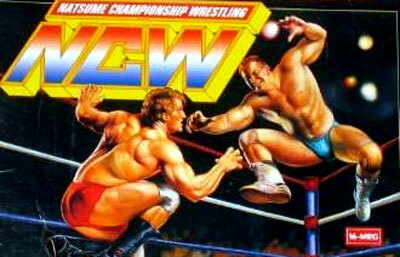 Natsume Championship Wrestling is one of the many unlicensed wrestling games released by in the heyday. It contains 12 fictional wrestlers (Asteroid, The Viper, Spike, Python, M. Roach, The Phantom, Big Ape, K-Bruto, H. Snake, Fangz, J. Kraze and Conan). The game modes include 1P v. CPU, 1P v. 2P, a regular and a tag team tournament or a round robin tournament to compete in. Each wrestlers has a very extensive set of moves, where different moves can be performed based on the ring situation (grappling, holds, dashes, on the ground, from ropes...) but in the end every fighter basically has the same set of moves, punch, kick, bodyslam, with a few unique ones like piledrivers and powerbombs. Each one also has his own devastating finisher.